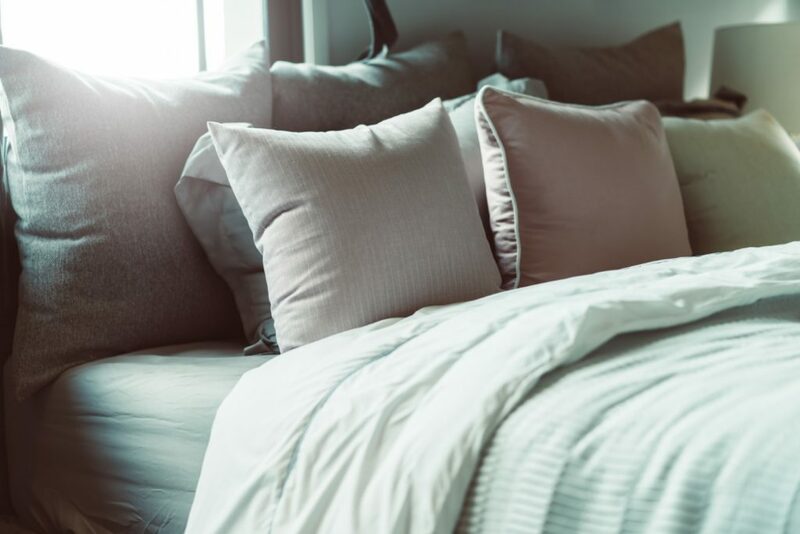 We all know that coffee and sweets before bed don’t add up to a restful night of sleep, but did you know your bedroom can also be helping or hurting your nightly Z’s? That’s right, the way you arrange your room can have a big impact on how you sleep at night! If you’ve been tossing and turning despite following all the conventional bedtime wisdom, it might be time to take a closer look at your space. Here are a few ways you can spruce up your room and feel more rested on your Tempur-Pedic while you’re at it! You’ve probably heard this a hundred times before: don’t use your cell phone before bed! But that warning is about more than just the dangers of getting caught up stalking exes on Instagram – it’s about the blue light that most electronic screens emit. TVs, computers, and even digital alarm clocks all send signals to your brain saying, “It’s daytime, get up and at ‘em!” Not exactly what you want in your space when you’re trying to sleep on your Tempur-Pedic bed. So, try to make sure TVs and computers are off and covered up at night, phones are far out of reach, and alarm clocks are dimmed or swapped out for analog options. Your brain will thank you! Or if not the whole town, at least your room! Some studies have shown that people sleeping in blue bedrooms on average get about two hours more sleep than people sleeping in rooms painted purple or brown. Blue is considered a calming colour, associated with rest and relaxation, which helps signal to your brain it’s time to chill out and get your snooze on. A fresh coat of paint or at least some blue drapes can make a big difference in the quantity and quality of your sleep. While we’re on the subject of drapes, you’ll want to make sure you invest in a good set for your bedroom. Light is the sworn enemy of a good night’s sleep, so be sure to cover your windows well. Street lights, passing cars, and the sun in the wee hours of the morning can disturb your rest and keep you from getting that refreshing REM sleep you need. Regular old blinds might look nice, but they tend to let light in between the slats. Blackout curtains are a great way to keep out unwanted light and make your bedroom feel more cozy and private. You don’t need a major room remodel to make your space more comfortable! Cleaning up clutter can make a world of difference in your nightly sleep. A messy space can cause anxiety and keep you from resting well, so spruce up a bit before you get cozy. A clean room and Tempur-Pedic mattress also limit late-night mental stimulation, so you’re not constantly distracted with visual reminders of all the things you have to get done in the morning. Of course, the most important part of your room’s sleep hygiene is your bed. Your Tempur-Pedic bed should be perfectly set up for rest and relaxation, so that you just can’t help but doze off the second you hit the sheets. That means clean, cozy blankets, plenty of pillows, and of course, a mattress that suits you perfectly. Your Tempur-Pedic mattress should be switched out approximately every five to seven years, or at the first visible signs of wear and tear. If you spend hours just trying to get comfortable every night or wake up with aches and pains all over, a new mattress should be the first bedroom upgrade you look for. There’s no single mattress type that fits everyone, so come into our store to try out all the options we have in stock, from soft to firm, twin to king, pillowtop to memory foam. A comfortable Tempur-Pedic bed is the first step toward the sleep of your dreams! Your sleep is important, so make sure your room is doing its best to guide you into dreamland every night! If your sleepless nights are being caused by a faulty mattress, come on down to our store. We have everything you need for a better night’s sleep, and our expert associates are ready with even more tips and pointers to help you start resting easier every night.